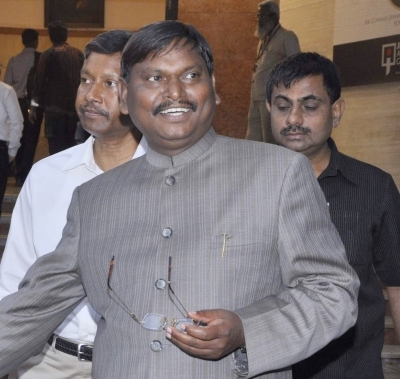 Ranchi, April 16 (IANS) Former Chief Minister of Jharkhand and senior BJP leader Arjun Munda, and former Union Minister Subodhkant Sahay filed their nomination papers on Tuesday. Munda filed his nomination from the Khuti Lok Sabha seat. He was accompanied by sitting BJP MP Karia Munda and All Jharkhand Students Union (AJSU) President Sudesh Mahto. Earlier in the day, Arjun and his wife Meera Munda offered prayers at Amreshwar temple in Khuti. After filing the nomination, he said: "People want Narendra Modi to became the Prime Minister again." The three-time Chief Minister of the state also attacked the grand alliance terming it "the alliance of profit". Munda was the Lok Sabha MP from Jamshedpur in 2009 and was also a member of the BJP's manifesto drafting committee for this election. He is pitted against the Congress and grand alliance's common candidate Kalicharan Munda. In Ranchi, former Union Minister Subodhkant Sahay filed his nomination papers. State Congress President Ajay Kumar and other leaders of the grand alliance were present on the occasion. Sahay was a Lok Sabha MP from 2004 to 2014 and served as the Food and Processing minister in the Manmohan Singh-led UPA government. The former MP also offered prayers at Deori temple and a chadar at the Mazar of Risaldar Baba in Ranchi. Sahay will face BJP candidate Sanjay Seth and rebel BJP MP Ramtahal Chaudhary, who is contesting as an Independent candidate.